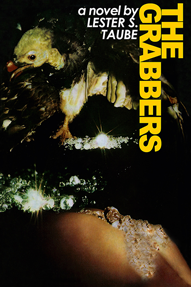 The Grabbers A diamond theft thriller? Dan Baldwin, an ex-colonel whose life has crashed, is rescued from a gutter in North Africa and finds himself elected at gunpoint to the company of a purposeful trio about to raid the secret diamond field of a relentless south-west African cartel. He contrives to locate the diamonds, and, for his pains, is left for dead by the gang’s treacherous leader, who has conspired to secure the entire illicit haul for himself. The furious climax is reached in London, where Dan, after a tempestuous clash and torrid love affair with the beautiful, blonde Ingrid Talaanger, daughter of the diamond cartel’s head, discovers that for all his violence and cynicism, he can again love a woman devotedly and be changed by her.